4 Bedroom Detached House For Sale in Beccles for Offers Over £425,000. 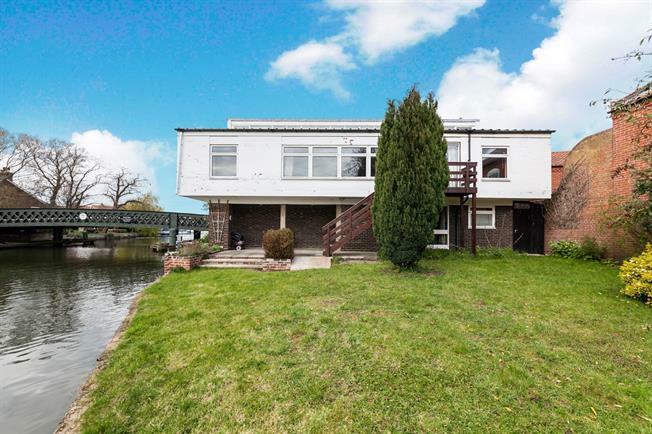 An unrivalled waterside position complete with private mooring, The Hermitage is an exciting and unique opportunity perfectly positioned within the heart of the town. A bespoke build, the property offers an unusual layout, thoughtfully planned to make the most of the stunning River Waveney views leading up to the Beccles Church Tower. Offering scope for refurbishment, those with imagination could realise a truly magnificent home within an incredibly special location. Leading into the property, on the ground floor there is a utility room leading from the entrance hall in addition to the study/bedroom four. The double integral garage benefits from an internal door and a further workshop/store leads internally from the double garage. Rising to the first floor, the vaulted kitchen/dining room is generous in size with a window to the rear which offers a peek of the river. The sitting room is simply spellbinding with panoramic windows soaking up the best of the views, upwards of the river offering a stunning view of the historic town. Leading from the vaulted inner hallway, three double bedrooms lead from here in addition to the bathroom, shower room and separate cloakroom. Outside, a first floor balcony offers steps down to the private riverside garden and access to the private mooring. The driveway to the front of the property allows parking for three vehicles and access to the double garage.